If you like Buffalo chicken wings then you will love this recipe! 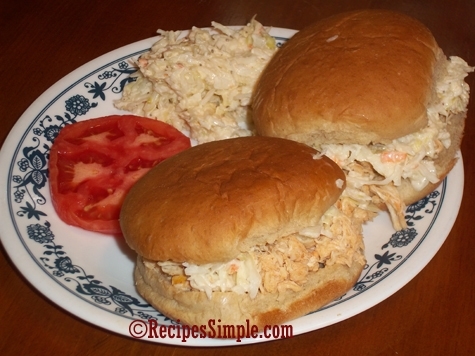 The chicken breasts are slow cooked in hot wing sauce and then shredded and served on hoagie rolls, potato rolls, hamburger buns or whatever you have on hand. It’s very easy and versatile. My family likes to add Coleslaw to ours. They are great served with a side of celery and carrots with ranch or blue cheese dressing. The chicken is so moist and tender. These are so good! Mix hot wing sauce with 2/3 cup water and pour over chicken in slow cooker. Cover and cook on LOW for 7 to 8 hours or on HIGH for 5 to 6 hours. Remove chicken to plate and shred with two forks. (I just shredded it in the slow cooker). Add back to slow cooker and mix with remaining sauce. Serve on hoagie rolls or hamburger buns and top with your choice of dressing. Add your favorite toppings. 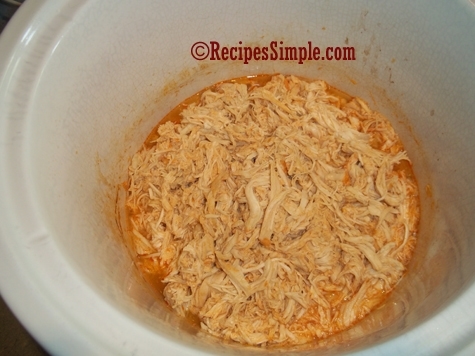 This is what it looks like after you have shredded it in the slow cooker and it is ready to pile on the sandwiches. So easy and so delicious!